Over time, fans in your home may start to run slow. Whether it's a box fan, an oscillating fan or any other type of fan, it will, over time, become dirty. The buildup from static, pollutants and dust can slow down just about any fan if it is not cleaned from time to time. A simple inspection and cleaning can help get your fan back up to speed and increase its longevity. Buildup from dust and pollutants can slow a fan over time. Unplug the fan. Remove the protective fan grate or housing, if any, using a Phillips screwdriver. Examine the shaft beneath the fan blades. Use a flashlight, if necessary, to get a close look. Pull off any accumulated matter using your fingers or a paper towel. Your screwdriver can be used if strings or other tough material need to be pulled off the fan. Use cotton swabs to wipe away any dirt that has accumulated. Spin the fan blades using your hand. Check to see if any of the blades are bent or warped. If any are bent, gently bend them back into place and spin them again with your hand. Repeat until the blades appear to spin without a wobble. Spray lubricant on the shaft of the fan, spinning the blades as you go. Spray in such a way that lubricant gets into the areas beneath the blades, where the blades attach to the shaft. Reassemble the fan by reattaching the protective cover. Replace the screws, if any, using your screwdriver. Plug the fan back in and turn it on. 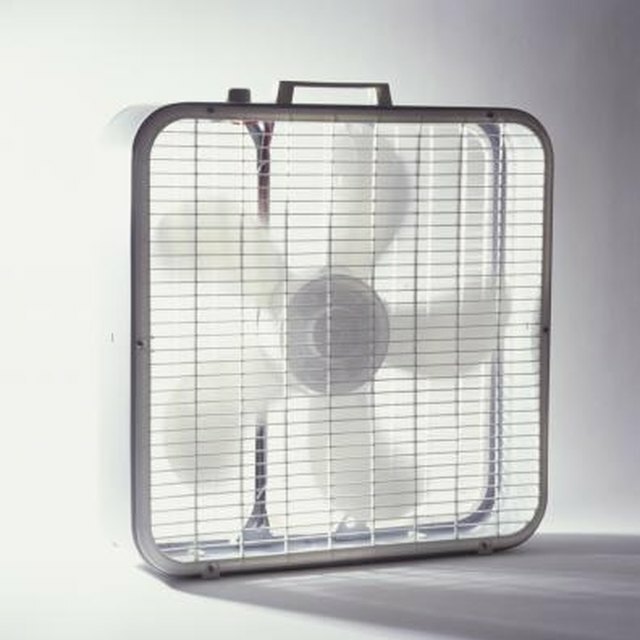 Spray a little lubricant on your fan's shaft from time to time; more frequently if the fan is used a lot. Keep the fan blades clean as well because clean blades will improve the fan's performance. Sometimes even a fan that won't turn at all can be restored to full speed by cleaning it. Do not work on a fan while it is plugged in.